Truer words were never spoken, no matter how confusing they may be. It is with that thought in mind that Spectrem conducted a study of Millionaire financial literacy. In The Financial Literacy Gap Among Millionaires, Spectrem asked investors about their financial education background, how they educate themselves on financial matters today, and whether they depend on their advisor to provide education as part of their duties. But the study also gave investors a small test of their financial knowledge, and the results were noteworthy not only for the investors who answered questions incorrectly, but for those who admitted “I Don’t Know". In Spectrem’s study of investor portfolios – Asset Allocation, Portfolios and Primary Providers – 26 percent of all investors claimed to be “very knowledgeable” about investments and finances and 55 percent self-described as “knowledgeable”. Only 19 percent placed themselves in the “not very knowledgeable" or “not at all knowledgeable” categories. So that equates to 81 percent of all investors claiming some level of financial literacy. Yet, in The Financial Literacy Gap, more than 50 percent of investors did not know the definition of the investment terms “alpha” and “beta”. Alpha is the historical measure of an asset’s return on investment compared to the risk-adjusted expected return, and beta measures how an asset moves relative to an index benchmark. Those are definitely technical terms related to investment strategies. Investors could easily make wise investments and have an income-producing portfolio without knowing those terms. But that data flies in the face of the self-held opinion that investors are knowledgeable or very knowledgeable about financial topics. 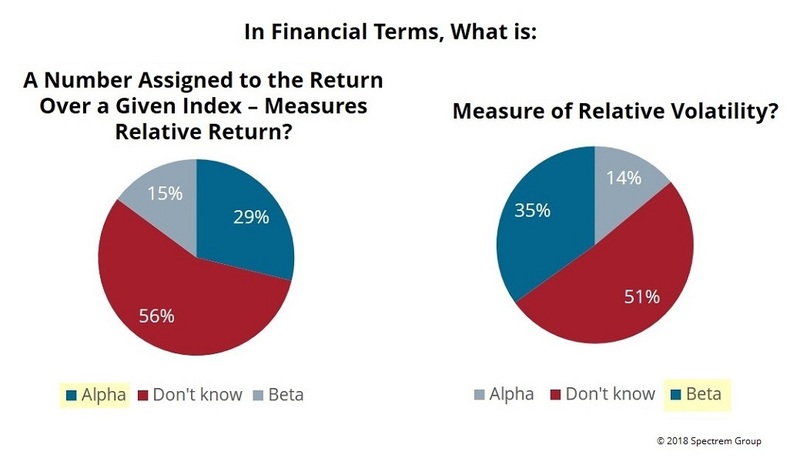 Should your investors know what “alpha" and “beta" mean? Perhaps not. Perhaps only the wealthiest or most active investors would benefit from that knowledge. But is it an advisor’s task to ensure investors understand those terms? The definition of a fiduciary is a hot topic in investment circles, especially among investors with retirement funds. Asked to select the definition of a fiduciary out of a list of five possible answers, only 56 percent selected the correct answer, 36 percent got the wrong answer and 9 percent admitted not to know. Does any of this matter when it comes time to advise investors about portfolio decisions? That may depend on the investor and it may depend on the advisor, but it is a topic of conversation for investors and advisors to discuss. Your firm may have a policy regarding investor education, and may have a library of informative articles to be used when an investor has a specific question. But advisors would be wise to make sure their library is up-to-date on key questions, because the field of investment strategies is a fluid one, and new questions crop up on a regular basis.